Renaissance brotherhood ring with two coat of arms behind transparant window: Description by Adin Antique Jewelry. There's a depth to this 18K yellow gold Renaissance ring as it must have gone to astonishing lengths to make it from the year 1580 to our present time. 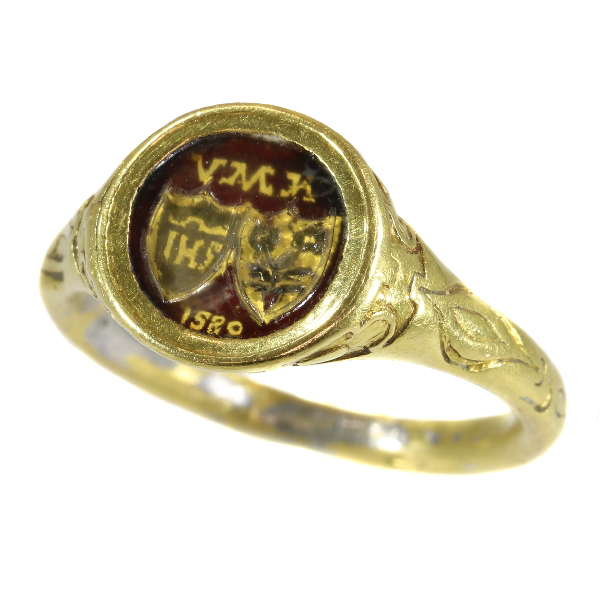 The identity of the initial owner is fused into four engravings embedded in red enamel in the top of the ring and safely sealed off presumably by a small slice of rock crystal. One coat of arms with the Christogram "HIS" and one with a monogram of a flowering stem both topped by the letters VMK must symbolise a brotherhood of great beliefs. We dare say even of great importance, as the ring is made out of 18K gold which elevates it to a higher level of noblesse. Once, this ring may have been crafted as part of a person's history, but each person it touches here and now actually becomes part of the ring's own chronicle. What an extraordinary experience to be part of something before and beyond yourself. Style: Renaissance - The Renaissance (Italian: Rinascimento, from ri- "again" and nascere "be born") was a cultural movement that spanned roughly the 14th to the 17th century, beginning in Florence in the Late Middle Ages and later spreading to the rest of Europe. The term is also used more loosely to refer to the historic era, but since the changes of the Renaissance were not uniform across Europe, this is a general use of the term. As a cultural movement, it encompassed a resurgence of learning based on classical sources, the development of linear perspective in painting, and gradual but widespread educational reform. Traditionally, this intellectual transformation has resulted in the Renaissance being viewed as a bridge between the Middle Ages and the Modern era. Although the Renaissance saw revolutions in many intellectual pursuits, as well as social and political upheaval, it is perhaps best known for its artistic developments and the contributions of such polymaths as Leonardo da Vinci and Michelangelo, who inspired the term "Renaissance man". Resizing: Resizing is possible but because of the age of the ring we prefer to leave it untouched. We could make an additional inner ring so the ring itself is not harmed, for this work we have to charge. We cannot guarantee to make it on every size; so please ask in advance. Return policy on this ring is not valid anymore once this work has been done.